1. Touchpad. Big chip in the middle is the panel controller. 2. Cable, which connects to the motherboard power LED indicators - the block below and to the left. 3. Cable, which connects the motherboard to the touchpad. 4. Cable, which connects the motherboard to the power button. 7. The date of manufacturing. 1. 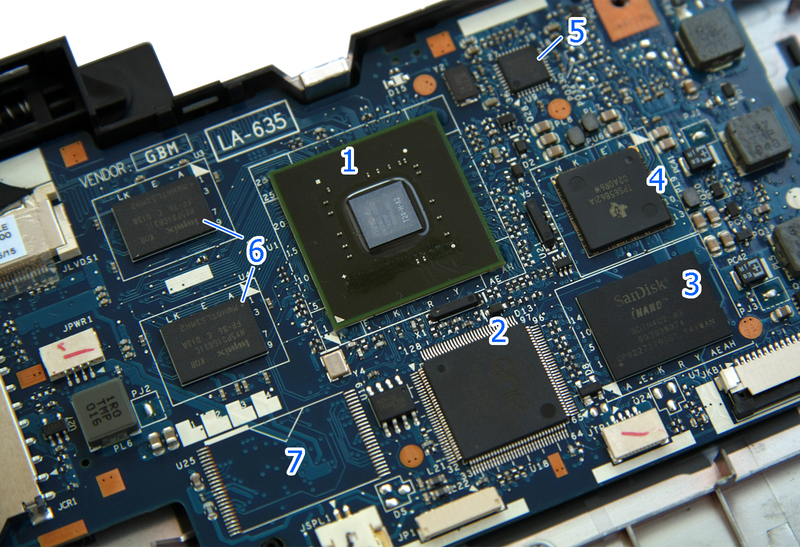 Main part of the motherboard, in more detail below. 5. USB - a standard connector and a 8-pin mini USB. 6. WWAN Ericsson F3307 1). 11. HDMI. Below - audio jack. 2. ENE KB926QF keyboard controller. 4. Texas Instruments TPS658621A - multi-chip power management with built-in charger for Lithium-ion batteries. 6. Two memory chips Hynix HY5PS1G431C FP-S6 DDR2-800, 1 Gbit per chip - total of 256 MB x 2.